For years, Clayton Kershaw was baseball's unquestioned top ace. But things are no longer that simple. First things first, let’s make something clear: Clayton Kershaw is still really, really good. He led the National League in ERA last season and finished second in Cy Young voting despite throwing only 175 innings. This year, he looks again like his usual, excellent self, with a 2.84 ERA and more than a strikeout per inning. So we mean no insult to the three-time Cy Young winner when we say that he is no longer the unquestioned best pitcher in baseball, no longer the one guy against whom all other hurlers are measured. 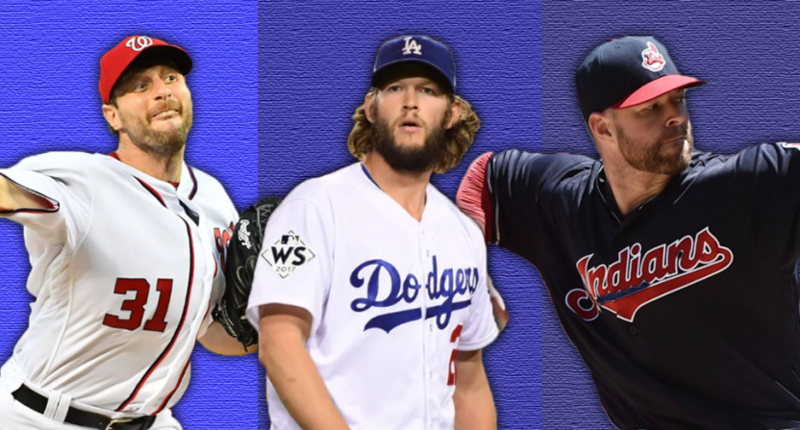 That for the first time in at least five years, thanks to Kershaw’s injuries and other pitchers’ excellence, the question of baseball’s top pitcher has no easy answer. These days, a few different dudes have a claim at being the sport’s elite ace. There’s Max Scherzer, who has won back-to-back NL Cy Young awards and is working on his fourth straight year of a sub-3.00 ERA. There’s Corey Kluber, who won AL Cy last year with a league-leading 2.25 ERA and is off to an even better start in 2018. There’s Chris Sale, baseball’s King of Ks, who has finished top-five in Cy voting in five straight seasons and last year became the first pitcher since 2002 to eclipse 300 strikeouts. There’s Justin Verlander, who has thrived since arriving Houston last July, including in the postseason. And then there’s Kershaw, still as dominant as ever. So who wears the crown these days? There’s no right answer, but we’ll try to find one anyway. Let’s start with the five pitchers’ stats since the start of the 2016 season. That’s a somewhat arbitrary cutoff, but one that allows us to consider a substantial sample size while remaining fairly current. That’s a lot to process, but the biggest takeaway is this: Over the past two-plus years, Kershaw has been easily the best pitcher in the world when he’s on the mound. Since the start of 2016, he boasts baseball’s best ERA, FIP and adjusted ERA+, making him the undisputed champion of rate stats. Before we go any further, let’s talk about the playoffs. Kershaw’s October struggles are well-documented, and although we’re not going to call him mentally fragile or suggest he can’t have a Koufaxian postseason this fall, we can’t deny that all those poor playoff starts happened. They reflect something about Kershaw. And yet… here’s how Kershaw’s postseason ERA over the past three years stacks up against that of our other best-pitcher candidates. Despite all the fuss about Kershaw’s playoff performance, the truth is many aces struggle when facing the best lineups in the game, often on short rest. Of these five pitchers, only Verlander has really bolstered his resume in October. All four others have had both ups and downs in October. So if we’re not going to demerit Kershaw for his postseason performance, there’s no real argument against the fact that he’s the best hurler around… at least when he’s healthy. But that’s the rub with Kershaw these days. He just doesn’t stay healthy the way his rival aces do. Yes, his low innings count owes in part to the Dodgers’ liberal use of the disabled list. But the fact remains that Kershaw has missed significant time in each of the past two seasons, and that his back problems could easily recur at any time. At this point, that’s part of the Kershaw experience, and it hurts his claim at being baseball’s best pitcher. If you judge the Best Pitcher in Baseball pageant on a per-inning basis, the winner is probably Kershaw. But it’s certainly fair to demerit — or even discount — the Dodgers lefty for having thrown 20 percent fewer innings than the other four candidates since the start of 2016. And if you do so, you’re back to the drawing board. So who’s the best pitcher among Kluber, Sale, Scherzer and Verlander? Here’s that same chart again, only this time sans Kershaw and with the leaders in each category bolded. Kluber is the guy who jumps out. Of these four, he has the best ERA, the best ERA+ and the best FIP, which all rolls together to give him the top WAR according to Baseball-Reference (whose formula is based on runs allowed), as well as the second top WAR per FanGraphs (whose formula is based on a more theoretical fielding-independent model). He also has, according to FanGraphs, the best individual pitch in the bunch, with a curveball that stumps hitters even more than Scherzer’s slider or Verlander’s fastball. The only thing holding Kluber back here is his innings pitched. He has made the equivalent of two or three fewer starts than the other top aces in question since 2016, which hurts his overall value. Unlike Kershaw, however, Kluber doesn’t have recurring injuries that appear likely to pop up again. He missed a few starts last spring with a lower back strain but returned to capture the AL Cy Young award and hasn’t had any issues since. Another thing in Kluber’s favor is that he seems to be trending positively, having improved from a 3.49 ERA in 2015 to a 3.14 in 2016 to a 2.25 in 2017 to a 1.96 so far this year. And although FIP doesn’t tell quite as clean a story, it’s clear that the 32-year-old Kluber has not begun any sort of decline, even as his velocity has dipped slightly. Throw in the fact that Kluber, unlike Scherzer, pitches in the somewhat tougher American League, without the luxury of facing a pitcher at the bottom of every order, and he looks like the choice as baseball’s best hurler. Of course, you can credibly argue in favor of other candidates as well. Scherzer has been just a touch behind Kluber in the rate stats but thrown more innings and fanned more batters. He would make for a defensible choice. Sale leads the bunch in fWAR, striking out scores of hitters even in the tough AL East. And if you’re inclined to give Verlander a bump for his postseason performance, he’s right in the conversation as well. Today, we’re going with Kluber as the best pitcher in baseball, at least until Kershaw puts questions about his back behind him. Tomorrow, a week from now, a month from now or at the end of the season, the answer could be entirely different.